Successfully Added Outdoor LED Torch - IP65 Waterproof, Solar Panel, 2200mAh, 35 Lumens, Over Charge Protection, Day And Night Identification to your Shopping Cart. Light up your pathway with this beautiful LED torch. Thanks to its solar panel, this outdoor LED light provides you with light in the darkness for years to come. 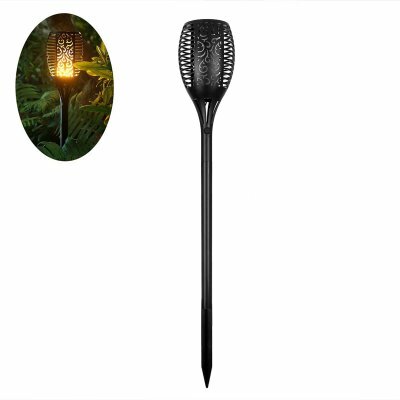 It features a beautiful torch design thanks to which it looks great in any garden. You’ll be able to light up your yard and pathway in style with this beautiful LED lighting. When fully charged, your solar-powered LED treats you to 10 hours of continuous usage time. This is enough to get you through the longest and darkest of nights without running out of juice. Thanks to its highly efficient solar cell, this outdoor LED can be used without the need for any cables or power. It comes with a large 2200mAh battery that gets automatically recharged throughout the day. Your smart light is capable of identifying day and night – allowing it to turn itself on automatically after dark. It also comes with a manual on/off switch so that you’ll be able to shut it down completely when not in use. The garden light is IP65 waterproof rated so you won’t have to worry about leaving it outside throughout the year. Your new LED torch treats you to 35 lumens of light. This warm and soft yellow light creates a great atmosphere in your garden. Its battery is protected against over-charging so you won’t have to worry about it getting damaged when exposed to the sun for a long period of time. Simply place it in your garden, turn it on, and you’ll be all set to enjoy a stylish source of garden lighting for years to come. This LED torch comes with a 12 months warranty, brought to you by the leader in electronic devices as well as wholesale Outdoor LED lights..